Zebra mussels (Dreissena polymorpha) were first detected in the Great Lakes in 1988. They were likely transported as larvae or young adults inside the ballast tanks of large ocean-going ships originating from Europe. Since their introduction, they have spread throughout the Eastern, Midwestern, and Southern United States. In 2007, Quagga mussels (Dreissena rostriformis bugensis) were found in the Western United States in Lake Mead, Nevada; part of the Lower Colorado River Basin. State and Federal managers are concerned that the mussels (hereafter referred to as dreissenid mussels or mussels) will continue to spread to the Columbia River Basin and have a major impact on the region’s ecosystem, water delivery infrastructure, hydroelectric projects, and the economy. The transport and use of recreational watercraft throughout the Western United States could easily result in spreading mussels to the Columbia River Basin. The number of recreational watercraft using Lake Mead can range from 350 to 3,500 a day (Bryan Moore, National Park Service, oral commun., June 21, 2008). Because recreational watercrafts are readily moved around and mussels may survive for a period of time when they are out of the water, there is a high potential to spread mussels from Lake Mead to other waterways in the Western United States. Efforts are being made to prevent the spread of mussels; however, there is great concern that these efforts will not be 100 percent successful. When prevention efforts fail, early detection of mussels may provide an opportunity to implement rapid response management actions to minimize the impact. Control and eradication efforts are more likely to be successful if they are implemented when the density of mussels is low and the area of infestation is small. Once the population grows and becomes established, the mussels are extremely difficult, if not impossible, to control. Although chemicals may be used to kill the mussels, the chemicals that are currently available also can kill other aquatic life. Early implementation of containment and eradication efforts requires getting reliable information to confirm the location of the infestation. One way to get this information is through the use of properly trained SCUBA divers. This document provides SCUBA divers with the necessary information to conduct underwater searchers for mussels. However, using SCUBA divers to search for mussels over a large geographic area is relatively expensive and inefficient. Early detection monitoring methods can be used to optimize the use of SCUBA divers. Early detection monitoring can be accomplished by collecting water samples or deploying artificial settlement substrates (fig. 1). Water samples are used to look for free-swimming larval mussels (called veligers). Because the veligers cannot be identified with the naked eye, the water samples are sent to a laboratory where they are examined under a microscope and/or analyzed using molecular techniques to detect veligers. To detect the presences of adult mussels, artificial substrates are deployed and periodically retrieved to determine if mussels have settled on the substrate. If veligers or adults are identified, SCUBA divers can be deployed to confirm the presence of mussels. 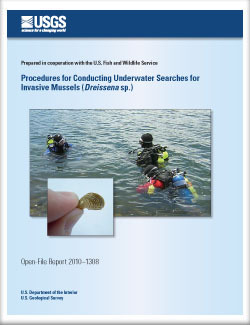 Adams, Noah, 2010, Procedures for conducting underwater searches for invasive mussels (Dreissena sp. ): U.S. Geological Survey Open-File Report 2010-1308, 44 p.